Congressmen Jim Himes, Chris Murphy, and Joe Courtney are no doubt secretly hoping congressional business keeps them in Washington on Thursday. If their calendars on Capitol Hill are clear they might hope for thunderstorms to leave them stranded at Reagan National Airport, or a sudden case of something…anything to prevent them from being photographed with President Obama when he visits Connecticut. The new Quinnipiac Poll shows the President’s approval rating in the state in a tailspin: 45%, down from 50% in the last poll, and down from 71% in April of 2009. According to the mastermind behind the Quinnipiac University poll Doug Schwartz, the President’s approval figure is even lower in the 2nd, 4th, and 5th districts. In 2006, those three seats were all held by Republicans. 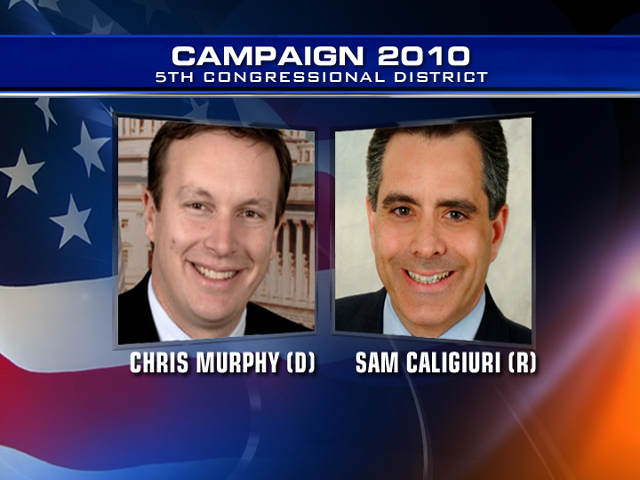 In the 5th district, Congressman Murphy has his work cut out for him in terms of defending his votes for the President’s policies. Only 38% of those polled in the 5th approve of the job President Obama is doing, and a whopping 60% disapprove. The 5th is also home to the highest unemployment in the state, 12.2% in the Waterbury area. On Face the State last week, Congressman Murphy said he would be proud to stand by the President on Thursday, but these new bleak numbers may have his advisors scrambling to find him another commitment, pronto. Republican Sam Caligiuri is already tagging Murphy with a big “O” on his back. The only poll we have seen in the race so far is an internal one released by the Caligiuri campaign, showing the race a dead heat. The Murphy campaign has not yet released a poll. It is also worth noting that in the 2008 presidential election, Obama won every Connecticut congressional district, but his margin of victory in the 5th was the narrowest in the state. The President’s approval rating also tumbled in the 2nd district to 41% from 46%. 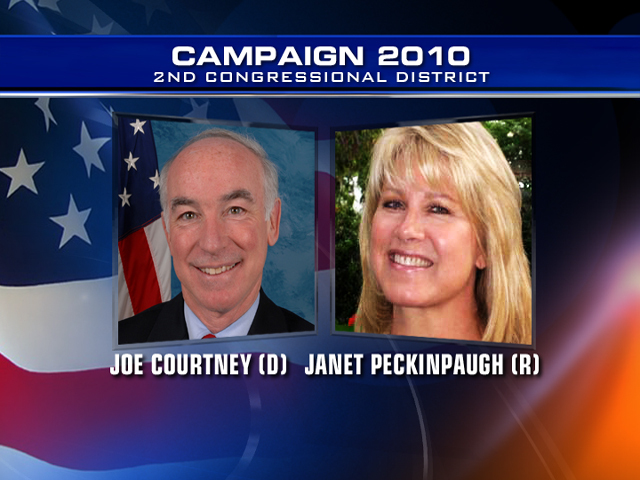 Democrat Joe Courtney is going for a third team, and Republican challenger Janet Peckinpaugh is using part of the formula Courtney used to defeat Rob Simmons in ’06: linking the incumbent to an unpopular president. A look at the 2008 presidential primary suggests support for the President in Courtney’s district may never have been that strong. When Barack Obama won the Connecticut primary he lost just one congressional district to Hillary Clinton: the 2nd. In the 4th, Congressman Jim Himes has been distancing himself from the President and the Democratic leadership for most of the summer. His spokeswoman told me Himes welcomes the President to his district this week, but will be in Washington for a vote. The President’s approval rating in the 4th is now at 43%, down from 48% in the last QU Poll. Challenger Dan Debicella, like Caliguiri and Peckinpaugh have been calling their opponents rubber stamps for the President. In this anti-incumbent year, that could resonate with voters. President Obama’s low approval ratings could also be a factor in the voting booth. A third of those polled in the QU survey said their vote for a senate candidate would be a vote against President Obama. Maybe John Droney was right. The GOP does not have a very good chance in any major CT race this year by any realistic measure. Two-thirds of Fairfield County voters think that Washington is on the wrong track. Our congressman, Jim Himes, disagrees. He voted in favor of the $787 billion dollar stimulus plan. After saddling your family with over ten thousand dollars in additional debt, we still have a ten percent unemployment rate. Himes voted the healthcare bill into law, a law which is already projected to cost more than was advertised. He voted to increase our national debt by a record $1.9 trillion dollars, bringing our total debt to a new high of $12.4 trillion dollars. If you want more of the same, then there is an incumbent congressman that is proud as hell of our current direction, but if you think that there is a better way, then you should know that Dan Debicella (http://www.debicella.com) thinks so too. If you would like to help Dan get his message of free enterprise, limited government, and individual liberty to the voters, then you can do so here: https://debicella.blue-swarm.com/donate. Please give what you can because Fairfield County deserves better. The Dems certainly won’t be swept out of office. 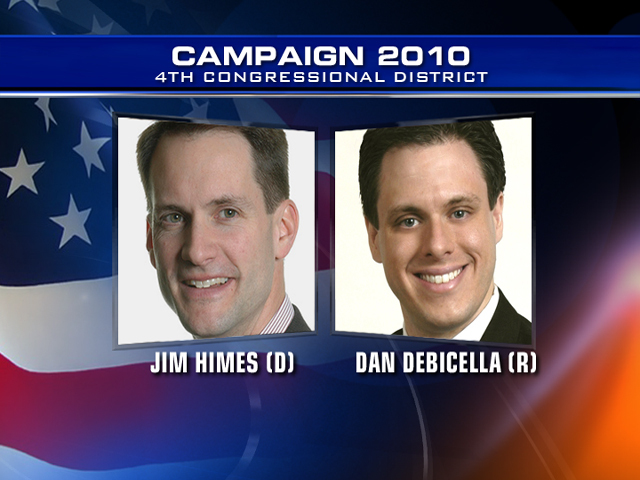 I can guarantee you that either Caligiuri of Debicella will turn their district around. There are too many people in the 5th and 4th Districts who are unhappy with the economic climate to support both Murphy and Himes.